Yes, asphalt. As in old technology. It’s a step back from the concrete revolution, though Tennessee Department of Transportation officials say this generation of asphalt is made to last longer. 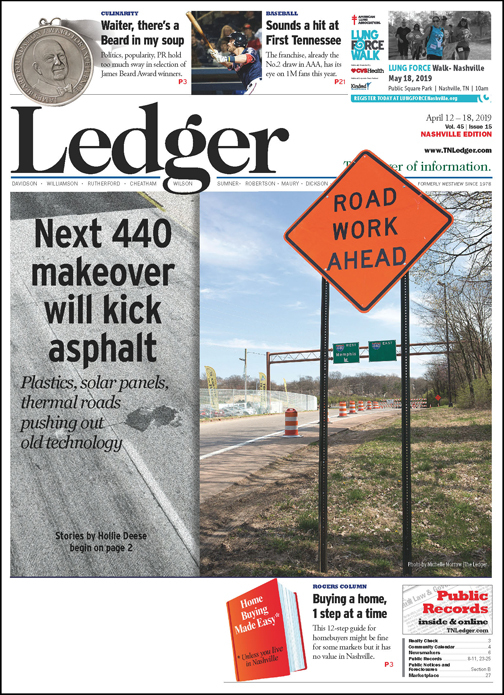 But that’s the future, says Clayton Markham, TDOT operations district manager and I-440 project manager, and asphalt and concrete are the only two options to build the road at this time. That doesn’t mean TDOT is not looking ahead. “We actually have an entire division within TDOT dedicated to materials and testing, looking at new materials for all aspects of highway construction and maintenance,” says Will Reid, assistant chief engineer at TDOT. There is a quarter-mile stretch on I-840 near Dickson where TDOT tests new materials. 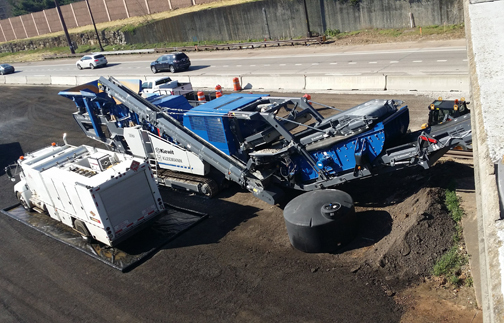 An impact crusher waits in the median of I-440 to recycle the roadway’s old concrete into smaller bits that will be used in the asphalt of the new surface. The roadbuilding industry seems to be in a less-conservative mindset and is pushing technology to greatly reduce or eliminate the need for pothole maintenance. Plastic is gaining proponents, partly because the nation must find a solution to its ever-growing problem of disposable consumer plastics. Recycled pellets can be added to hot-mix asphalt or into the asphalt used to resurface entire roadways. Eventually, roads that are nothing but recycled plastic could be possible. Plastics are currently being used in the asphalt mix for roads in the United Kingdom, Canada, Australia, India and New Zealand by companies like Scottish MacRebur, which adds approximately 20,000 single-use plastic bottles or around 70,000 plastic bags to every ton of its asphalt. Plastic road projects have gained more traction in the U.S. since China announced last year it would no longer buy U.S. recyclables. China was taking half of recyclable materials generated in the U.S.
One company, the California-based TechniSoil Industrial, does pothole work for about 100 west coast cities with a plastic-mix process called TrowelPave, which combines recycled asphalt with methylene diphenyl diisocyanate urethane. “The concept of roads made of recycled plastic is not a new idea, but as it becomes clear that we have a surplus of plastic heading to landfills and worse, the idea has recently garnered more serious discussion,” explains Jake McKenzie, content manager at Auto Accessories Garage in Chicago. If the plastic revolution fails to take off, there’s another solution in the works: better concrete. “I’ve been dealing with concrete for most of my adult life, and if you do it right and use good, quality materials, it should last for 35 years,” says Chris Tuan, a professor of civil engineering at the University of Nebraska-Lincoln who specializes in blast-resistant design and specialized concrete. 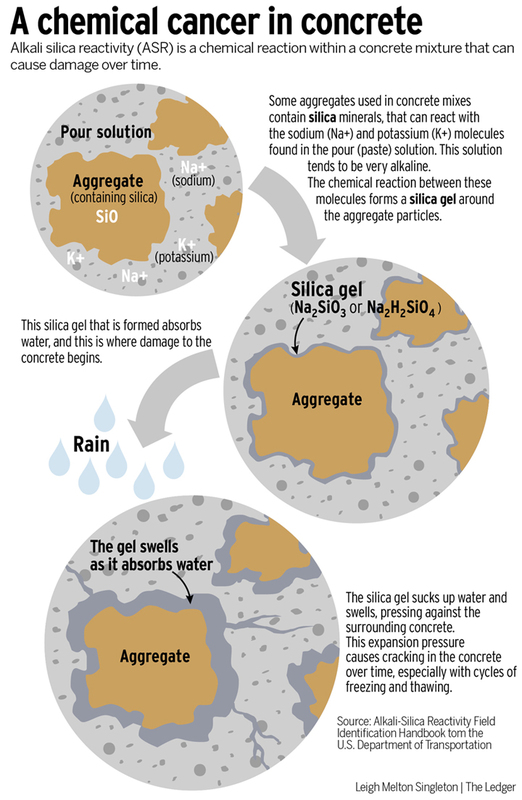 “These days, a lot of contractors or ready-mix plants, they use bagged aggregates, and it causes “ASR,” alkali silica reactivity. “Alkali is in the cement. Cement is very basic. If you use some aggregates, they are acidic in nature and they start a chemical reaction. “They form a gel which will expand when it absorbs water, and that cracks the concrete. Tuan has developed a conductive concrete that includes carbon particles and steel shavings in the mix that can carry enough electrical current to melt ice during winter storms. Tuan is working with the Federal Aviation Administration and other organizations on multiple applications for his patented concrete mixture. “I worked for the Air Force as a defense contractor doing the civil engineering support, mission support,” Tuan continues. “They had an issue. The heavy transporters were skidding on the icy runway during the Balkan War. And they had the request to see if we can have a good way not to damage the runway, to de-ice the runway. Tuan is not permitted to divulge the clients’ names using the concrete but says he is working on bus transit centers in two cities that will be announced soon. “Everything is cast in the concrete and, once it’s done, there is no maintenance whatsoever,” he continues. “You just have to make sure everything is made of good quality and everything is done correctly. Tuan is referring to a project he did with the Nebraska Department of Roads, making the 150-foot Roca Spur Bridge the world’s first to incorporate conductive concrete. Inlaid with 52 conductive slabs, it successfully de-iced its surface during the five-year trial run, Tuan says. With widespread usage, he adds, it could not only improve safety but all but eliminate pothole repair work, which costs Nashville $4 million annually. Tuan says his concrete roads cost about $350 per cubic yard, while regular concrete is about $120 per cubic yard. The savings is realized, he says, in the near elimination of maintenance costs. The electrical power required to de-ice the Roca Spur Bridge during a three-day storm is about $250, Tuan says, much less than truckloads of salt. A grooved texture that was part of an $8 million, 2009 rehabilitation project to improve safety conditions on I-440 and help preserve the aging concrete and assist with draining water from the roadway deteriorated much faster than its 12-15 year projected life span, in part, because of salt and a series of harsh winters that caused water to freeze in the grooves instead of running off. The only problem with Tuan’s invention is that it’s such a new technology the Federal Aviation Administration only recently approved it for air site application. But due to older electrical codes, he has to keep the voltage lower than 48 volts in order to use it. “Concrete is a semi-conductor,” he says. “It’s not like a steel plate. If the electric code says that, that’s red tape or an obstacle for the advancement of the technology. That’s the only issue. That’s why it’s not widespread. Because you have to step down the regular voltage of a power source to 48 volts. So that’s extra cost. But Tuan says it’s a change that won’t happen in his lifetime. “People say the U.S. is regulation nation. Well, if it’s a good regulation, by all means. But there are a lot of regulations that simply put the chokehold on new technology,” Tuan notes. Dary Merckens, chief technology officer of Gunner Technology, says tire tech will likely change faster to deal with roads that are becoming worse and worse. “Pretty soon, in addition to various enhanced polymers that make tires more durable, we’ll have a nonpneumatic tire solution that will eliminate a lot of the headaches we currently experience with subpar roadways,” he explains. Matthias Alleckna, an energy industry analyst at EnergyRates.com, an energy rate comparison website, says many engineers are researching how to include roads in climate action programs. “Some say the future of roads are recyclables, whereas others affirm we will see more solar panels and wind turbines,” Alleckna points out. “Some of the most ambitious projects even include solar panels on the roads, and not just by [beside] them. Solar road panels are also in play, with companies like California’s Solar Roadways creating a modular system of special-engineered panels that can be walked and driven upon and even contain LED lights to create lines and signage without paint. Like Tuan’s concrete, solar panels also contain heating elements to prevent snow and ice accumulation. 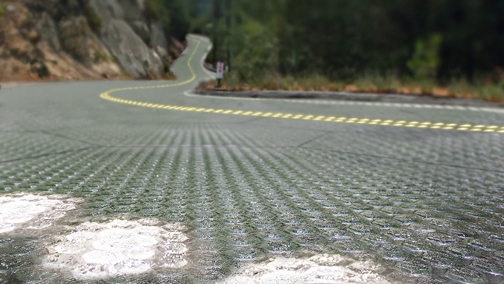 Solar Roadways has completed two funding contracts with the U.S. Department of Transportation, and the company was awarded a third contract in November 2015. Grace Robertson with LightWave Solar in Nashville says her company has not done work on things like solar roadways because much of it hasn’t been commercialized yet, though the firm is working on solar for Tesla Powerwalls and will likely install the first Powerwall in Middle Tennessee in the coming weeks. The Powerwall is a rechargeable battery intended to be used for home energy storage, backup power and off-the-grid use. And there are more to roads than the roadway. Governments preparing for driverless cars have much to do with basics like automated signals for roadways, says Eric Simone, founder and CEO of Clearblade, a tech company that provides the platform for “Smart Cities” and driverless tech, smart mining and more. Driverless vehicles will mean roadways that are designed differently, with a reduced footprint, narrower right of way and no need for visual cues like road striping or traffic lights. The biggest impediment to driverless vehicles, Simone says, is government. “They’re not ready for this,” he says. “The technology’s there, but then you’ve got to get all these different constituencies working together, and that’s what I think is a bigger barrier. “You’re going to have government. You’re going to have interested parties, like insurance companies, that are going to be against moving so fast. It’s going to take some time.